If you have the Natural Disasters expansion pack for Cities Skylines it’s pretty simple to wreak havoc on your city with say, a tornado, an earthquake or a meteor strike (or two or three) without actually losing the hard work you put into building your town. That is, assuming you save it first. Besides simply saving your city, there are a couple of things you must do to preserve your city or town if you want to for example, watch that Tsumani flood your town. But before you watch any natural disaster level your city, if you don’t want to permanently lose your city you will need to also disable AUTO SAVING of your game and disable random disasters. Disabling these two options are very important if you don’t want any surprises later. In the options menu (on the main menu) or within the gameplay menu while in-game you must uncheck all the entries for automatically saving your game (such as to save a game automatically every 10 minutes or more). Why do this? Doing this insures you will have full control over your city before and after a disaster strikes. You don’t want the game to overwrite your city with an auto saved destroyed copy of your city by mistake! You will also need the make sure the Random Disasters option is unchecked too. If you haven’t already, you can add some of the buildings to your city which are included with the Disasters expansion such as an evacuation bunker, early warning system, helicopter depots and radio antenna if you so choose. It’s up to you what you do before you destroy your city just make sure it’s manually saved if you want to access it later. When you are satisfied with your saved city, you are ready to pick a disaster. The destruction caused by the disaster can be pretty devastating on your city but no worries because if you did everything correctly you will always have an untouched saved copy waiting to be destroyed again, and again if you so choose! Obvious but important note: Do not save your city after a disaster (without renaming the destroyed city first) if you want have access to your original untouched city in the future. My tips are intended for entertainment purposes and not officially endorsed by the maker of Cities Skylines. If you don’t want to lose your city, please save it. I will not be responsible for lost cities. Like Simcity? Read about my updated SimCity (2013) (aka SimCity 5) experience here. Although the mass of dust of displeasure over the forced multiplayer online only use in order to play SimCity 5 has mostly settled, Electronic Arts finally added single-player mode (offline mode) a year later. 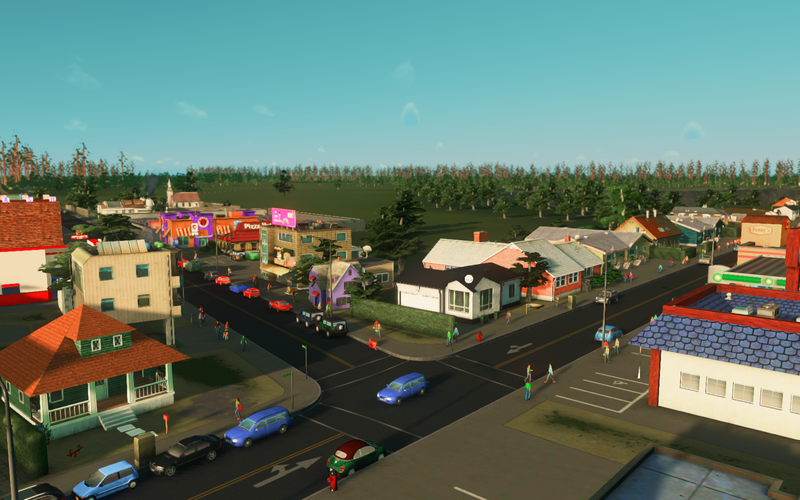 And now that it’s been nearly three years since the initial release of SimCity 5, there has been a significant price drop on the complete edition of SimCity, so I have decided to jump in to see how the latest SimCity stacks up with Cities Skylines. 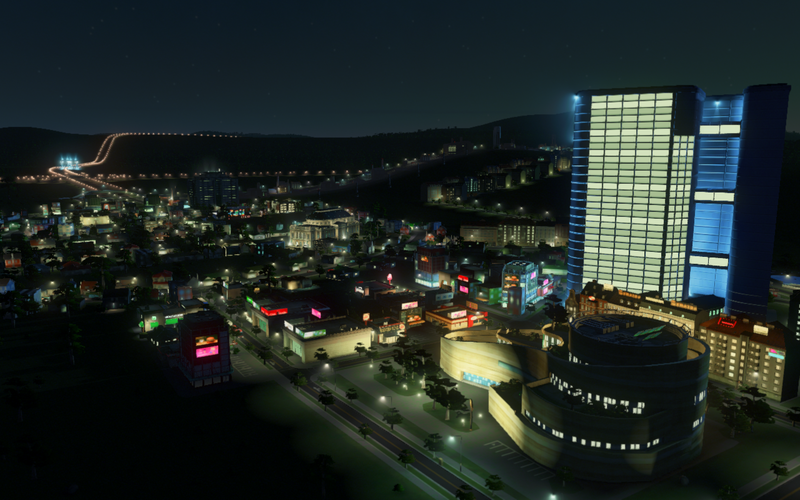 Cities Skylines it should be noted has received rave reviews by many and even has been proclaimed by some the city builder SimCity should have been (Read my experience here). Keep in mind that at the time I reviewed/experienced Cities Skylines, I did not own SimCity 5 so my comments related only to my experience with CS. Now that I own a copy of SimCity 5 let me cut to the chase and tell you what I do like about SimCity and what I don’t like so much. Along the way I also hope to note a few similarities and differences as it relates to Cities Skylines. First it is important to note that I have been playing the complete edition of SimCity with included expansion pack Cities of Tomorrow along with some others (see the complete list here). With the complete edition of SimCity in single player or offline mode, I have found the game pleasantly fun to play, slightly challenging (especially as one gets use to the various specializations available) but the game does not involve too much micro management to still have fun and for me the graphics and sounds have been a treat for the eyes and ears alike. I think graphically speaking, SimCity looks better as a whole and the models are rendered cleaner than they are in Cities Skylines. Out of the box the colors are certainly rich, vibrant and more appealing in SimCity and the buildings and city models are fun to watch and hear. To me it’s as if the player is watching a quality Disney/Pixar movie animation unfold that you get to be a part of! The sounds in SimCity are also well done. They are light and fun as if I was a kid playing in a toy store with bells, whistles and thematic music to top it off. And for me the game is not filled with over-the-top repetitive or annoying sounds at least that I have discovered yet. And with the expansion packs, a player is allowed to direct and form the kind of city he/she would like to build, whether it be amusement oriented, a gambling touristic mecca, trading hub, futuristic style, etc it’s up to him or her. 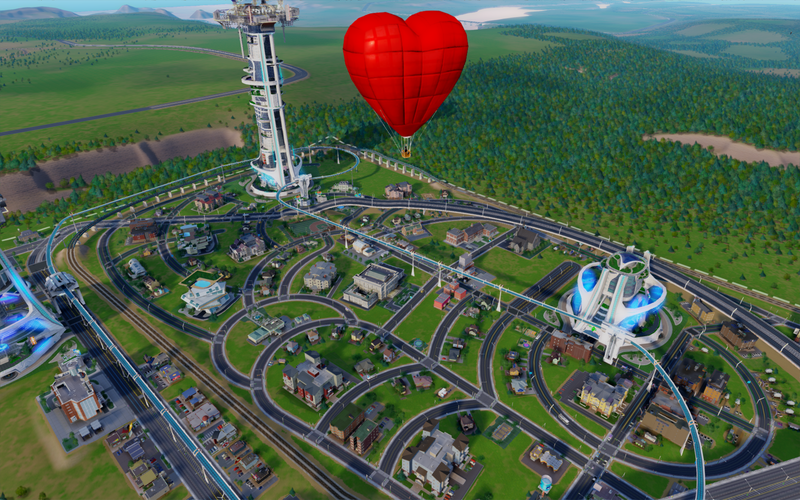 These are all reasons I love what I see so far in SimCity 5. Another thing I like about SimCity is how well it seems to run on my lower end machine with a not-so-great graphics card (gts 250). Even with lower in-game graphics settings the game still renders a fantastic looking game. In Cities Skylines with mods, it takes a toll on my lower end computer and gpu. In CS on my computer the edges of buildings for example cannot be rendered smooth as in SimCity even with a mod to do it. A final reason I like playing SimCity is….get ready for it…….drum roll please……….well, it’s American based! I didn’t think this would be such a big deal but after playing Cities Skylines for many days and hours I noticed I was beginning to feel a little culture shock. Weird? yeah I think so too. With SimCity being American made, it shows. For me, it just looks, feels and plays like a Pixar movie complete with a fantasy style rendering of a classic American city. 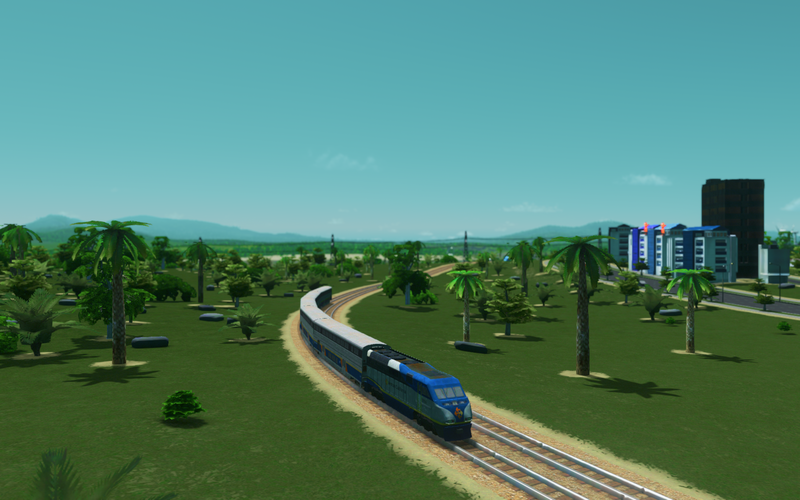 And out of the box without the use of mods, default American style buildings, vehicles and train tracks makes SimCity feel like something I might find in my backyard. Cities Skylines even with mods, still feels European with an old-style glaze to it (I’m gonna take a wild guess here and say this is probably due to the fact Cities Skylines was made over seas and not in America). There are at least a few things I have discovered about SimCity that I do not like. For starters, SimCity comes with small map sizes available to build on. This can be frustrating when one just wishes to build a larger sprawling city rather than a small city that can only go up. 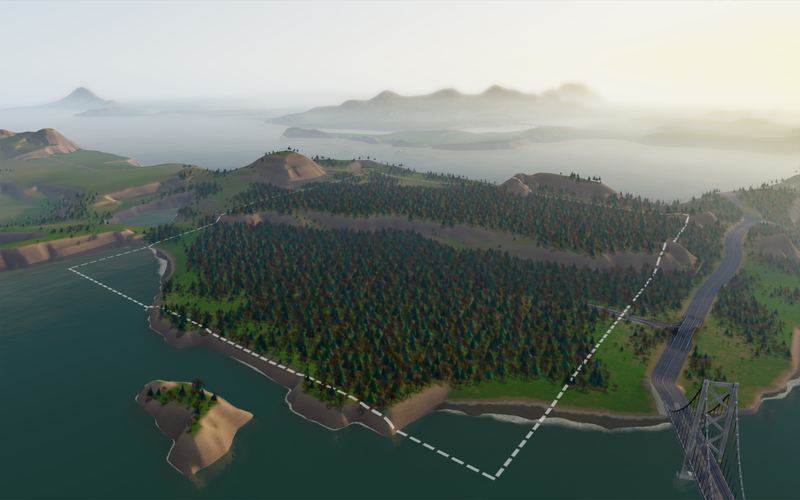 The map size department is where Cities Skylines got it right. These types of large expandable maps are what SimCity needs to make it even better than it already is. However, I will note that SimCity allows for the creation of multiple cities that connect to each other within a region. This is a neat feature of the game because you can simply move around a region to create different cities each with its own style and specialization or you can simply create various (although small land wise) cities to try out new features. 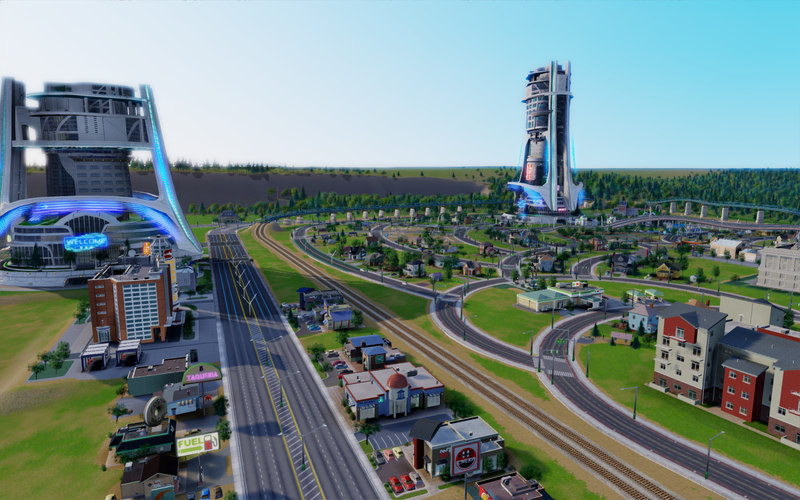 Cities Skylines on the other hand allows the creation of one mega city in a region which can get overwhelming with the micro-management necessary to keep the city healthy. This one reason as it sits right now, that if you want the best of both worlds you have to play both games. Although SimCity now has a Single-player/offline mode which definitely should have been part of the game from the start, I do wonder why EA decided keep us linked so closely to an Origin account. In fact in order to play the game you must log in to an Origin account (where the game was purchased) and keep the same Origin ID as your mayor name for every city you build. This seems silly especially if you wanted to build multiple cities in a region under a different mayor name as was the case in past SimCity games. 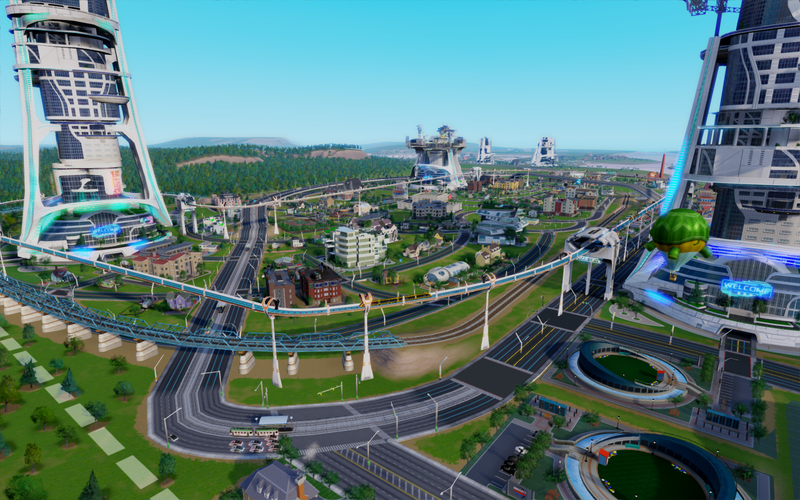 One other thing that SimCity lacks is great modification abilities by users (such as is the case with CS) for mods in-game such as regions, expanded maps or more roads and buildings. I also wish the game speed was a bit slower or at least a mod was available to slow it down as is in Cities Skylines. The mod complaints I have are only minor because if SimCity was built with larger maps or with the included option to create larger maps in the first place the game would be nearly perfect without mods. So how does SimCity 5 compare to Cities Skylines? I think it probably depends mostly on you, the game player. Since each person is different, we like and dislike different (or similar) things about a game. But as it stands right now, I think it’s great to be able to play and enjoy both games. Therefore the simple fact remains, both SimCity (2013) and Cities Skylines are very different games (aside from being city builders) and are far from being the same! UPDATE 6-19-16: I have since gotten a copy of SimCity (2013). Read about my SimCity (2013) (aka SimCity 5) experience here. Cities Skylines is a city builder game similar in-game play to the popular SimCity building series. After having time to play Cities Skylines I wanted to share some aspects of the game that I have found disappointing and discuss some issues I have yet to find discussed elsewhere online. Of course there are great things to like about the game and I do. Even though Cities Skylines is over a year old now it seems like a great game to play based on YouTube videos and online reviews. And all the reviews and opinions I have found online about Cities Skylines paint the game in a purely positive light while many criticize SimCity 2013 (aka SimCity 5) mostly for its once needed persistent online connection. It is important to note up front I have do not have much experience playing the latest SimCity 5 (aside from a free 2 hour trial) but have purchased Cities Skylines and have played it many hours. (Read my updated SimCity 5 experience here) My comments will be made mostly about the gameplay of Cities Skylines based on personal experience and opinion. Now as I have already mentioned, the game is worth buying for its price but user-created content and mods make it even better. 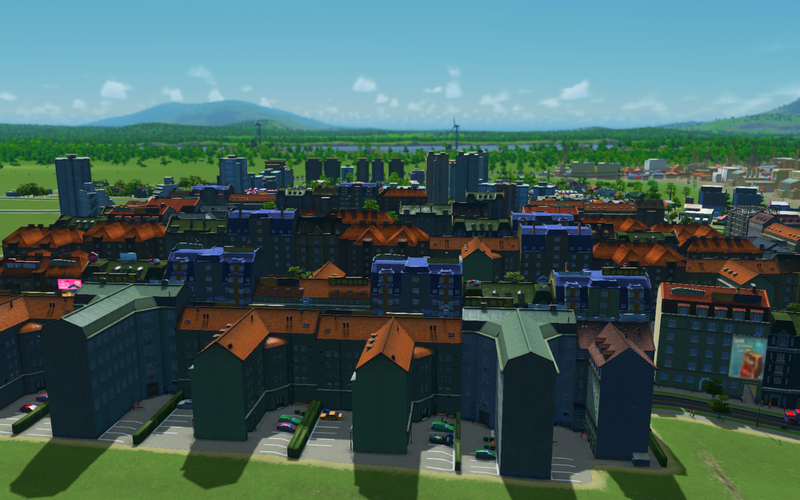 My problems with Cities Skylines come from the fact it is a European based game and it shows. Being an American and living in the United States there are game oddities in the vanilla version of the game that have been somewhat hard to overcome without a mod. 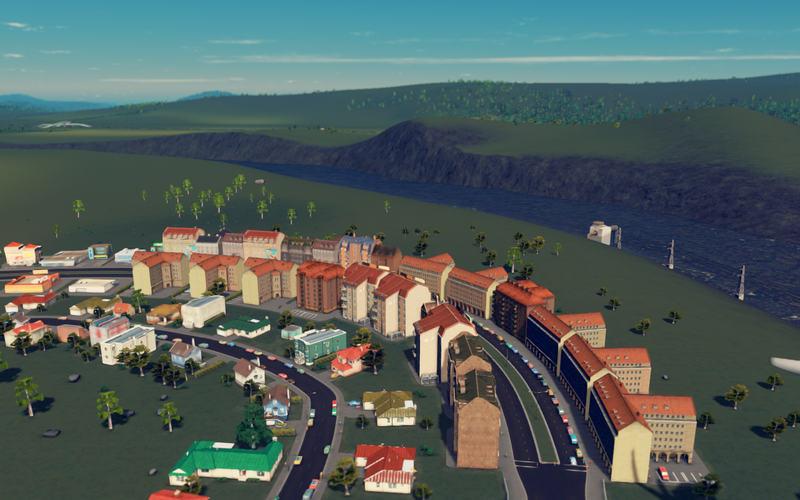 In fact, the Cities Skylines I play today includes quite a bit of user-created content such as Mods and Assets that vastly improve the game where it is lacking mechanically or visually or both. However, if one is looking for the game to be American in style without mods it can be lacking. Even when searching for user-created content to Americanize the game, I have found styles and content to be overwhelming foreign or European based. Don’t get me wrong I have found some American style created content such as American Roads or American sirens for emergency vehicles and even American style buildings, trains, planes, and other vehicles–but just a few. Although the European based styles are ok as options I would love to see more American variety besides New York City. What about rural Humboldt California, USA? As already mentioned, the vanilla game in my opinion is not very visually American (besides the default option of having vehicles driving on the right-side of streets) but the default building styles are no different. The included European looking buildings appear old and outdated lacking color and I didn’t much American style included without adding some user-created content found on Steam. I don’t believe overhead electric cables are the norm for many American rail systems across this great country unless we’re talking about a tram, cable or light rail system. The rail system in the heartland is open track (without overhead electrical lines) with diesel-powered locomotives rolling on them such as BNSF, Southern Pacific or Amtrak. Before you jump on me for mentioning the games lack of American style train tracks without an overhead electrical line, I use a Mod that removes the overhead cable on train tracks and it works great. 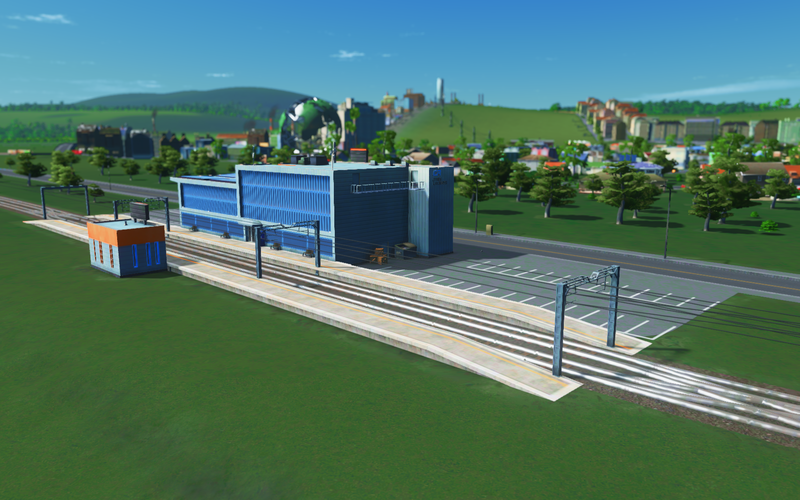 However, I have yet to find an American style passenger station asset without the overhead electrical cables! The include trucks, buses and other included vehicles overall also have a distinct European look many of us in the United States will find foreign looking. However, this foreign “look” can be somewhat remedied (like the overhead cabled train tracks) by adding some user-created American style vehicle assets which have been a welcome addition to my game experience. But keep an eye open for me as I am still looking for an American semi-truck trailer without 3 wheels on the back axle! If you are seeking realism in a city builder Cities Skylines has some. I say some because it’s a game. Now I don’t expect the game to be real to life in every possible way imaginable because after all it’s a simulation and it’s suppose to be fun. Yet, I do think some mechanics tweaks could be achieved to make it a little more fun. For me, one in particular is the simulation speed when the game is running at its lowest setting. To clarify, by speed I am not referring to performance or frame-rate but the simulation game-play speed. The vanilla game includes three simulation speed modes, slow, medium and fast. This is the rate at which the cars and people move on the street and buildings are erected within the simulation. Having a high-speed is a great option when you want buildings to grow fast or simulation time increased to build the city’s income. However, in my opinion the slowest speed is still too fast. Cars and people buzz around as if they have been put on fast forward and are little bees buzzing about on speed juice. At times, it can be almost hard to watch when I just want things to slow down to a more realistic pace. Yes, once again there is a mod for this. Introducing a slow game mod to the vanilla game does wonders for more realism. My question is, why didn’t the game creators include a slower mode with the base (vanilla) game? Read about my updated SimCity (2013) (aka SimCity 5) experience here.